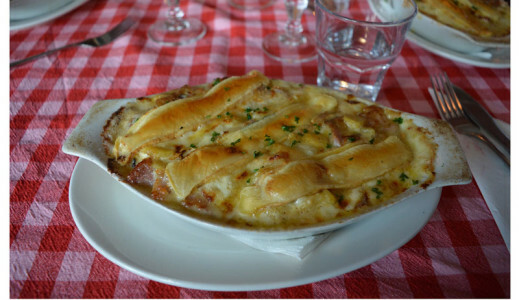 Tartiflette (French pronunciation: ​[taʁtiˈflɛt]) is a French dish from the Savoie and Haute Savoie region of France. It is made with potatoes, reblochon cheese, lardons and onions. A popular variation of this dish is to replace the lardons with smoked salmon. The word tartiflette is probably derived from the Arpitan word for potato, tartiflâ. ” This modern recipe was inspired by a truly traditional dish called “péla”: a gratin of potatoes, onions and cheese made in a long-handled pan called a pelagic (shovel) in the Provence region of France. It was developed in the 1980s by the Union Interprofessional Reblochon to promote sales of reblochon, as is confirmed also by Christian Millau (of the Gault-Millau Guide) in his gastronomic dictionary. Tartiflette was first mentioned in a book of 1705, Le Cuisinier Royal et Bourgeois written by François Massialot and his assistant cook B. Mathieu. The name derives from the Savoyard word for potatoes, tartifles, a term also found in Provençal. The Savoyards first heard of tartiflette when it began to appear on the menus of restaurants in the ski stations, conveying an image of authenticity and mountain terroir.